This dark chocolate panna cotta recipe is creamy, rich, and simple to make with just 5 ingredients. It’s gluten-free and paleo friendly. Made on the stove top, you can make mix it up in 10 minutes in the morning, chill it during the day, and serve it for dinner. It’s rich enough for company and easy enough for week night dinners. If you feel you need to hide in a bedroom where no one can find you and eat dark chocolate, serve up some chocolate panna cotta tonight. You won’t mind sharing when you see how easy it is to make. So many desserts are out when you have a wheat allergy. Even some desserts that you might not think of as “dangerous” can hold hidden wheat. I recently tried a “creamy Italian dessert” from Costco, as I was looking for something easy to serve at Sarah’s wedding in August. This creamy Italian dessert was rich and sweet made with dairy. It was served in little plastic cups. But unfortunately it was one of those “may contain wheat” desserts that Mr. Joybilee has to stay away from. I toyed with the idea buying this creamy Italian dessert for Sarah’s wedding but a better solution would be to figure out how to make them at home, so that they could be made allergy free. Then the Father-of-the-bride would be able to enjoy them too. 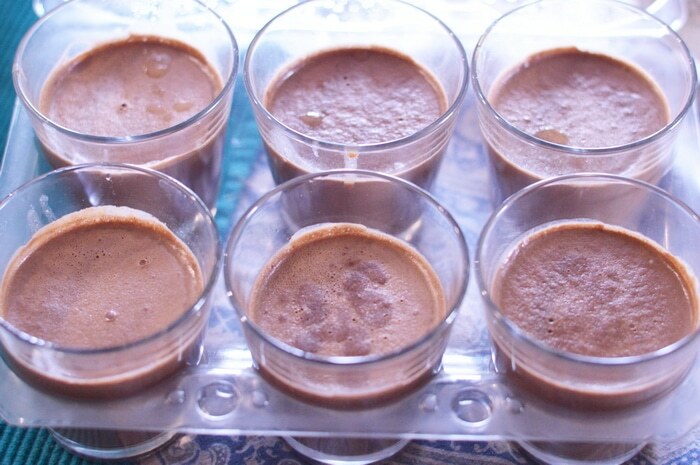 Trying to match the ease of the Costco creamy Italian dessert but with a gluten-free alternative I made up this dark chocolate panna cotta recipe that is better, richer, healthier that the dessert cups we purchased at Costco. Made with only 5 ingredients it can be whipped up in 10 minutes while you are doing something else. Pour the chocolate panna cotta into dessert glasses (hey, I’m recycling some glasses that came with a similiar dessert from Costco) and let them sit for 2 to 4 hours, or even over night, before serving. The Italian Dessert cups from Costco said “do not freeze” but my version is fine to slip into the freezer if you want to make it ahead for a special occassion. I’ll be using this recipe at Sarah’s wedding — It really is that amazing. And gluten-free so the Father of the bride can enjoy it, too. I used one can of organic coconut milk (400 ml) and 1 can of organic coconut cream (160 ml). But you can use homemade coconut milk, or canned coconut milk for this recipe, for a total of 2 cups. Pour the coconut milk or coconut cream into a 1 quart saucepan. Sprinkle gelatin on the surface of the coconut milk and wait 10 minutes for the gelatin to bloom. Place the saucepan over medium heat and heat gently. Using a whisk, stir in the gelatin until it is fully mixed into the warm coconut milk. 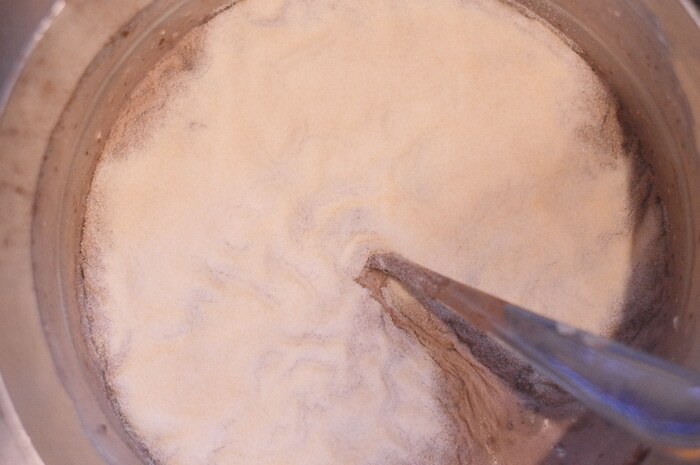 Stir in the cocoa powder and maple syrup. 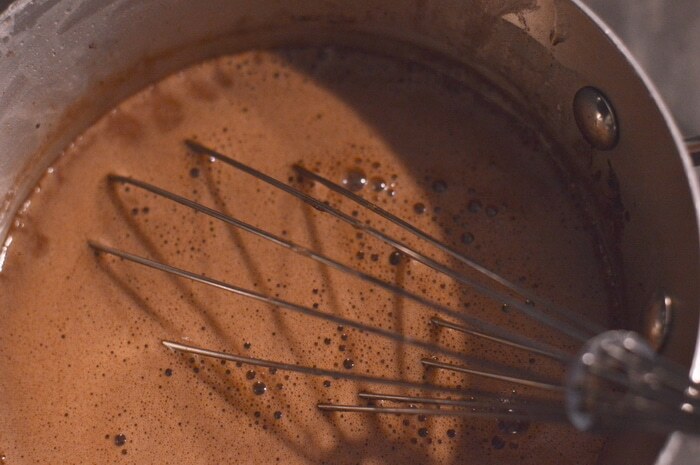 Whisk to get rid of any lumps and make the mixture smooth. Keep heating the saucepan over medium heat until the pan begins to steam slightly. Remove from the heat. 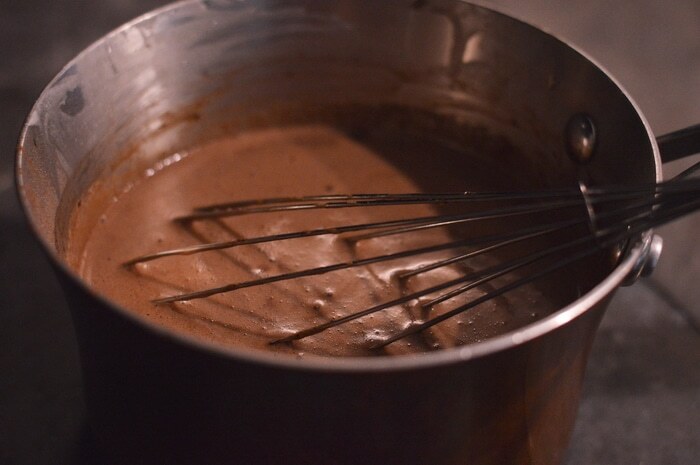 Stir in the dark chocolate pieces and keep stirring until all the chocolate is melted and the mixture is smooth. Ladle the panne cotte into 4 ounce dessert dishes, filling about 3/4 full. Chill for 4 hours or overnight. 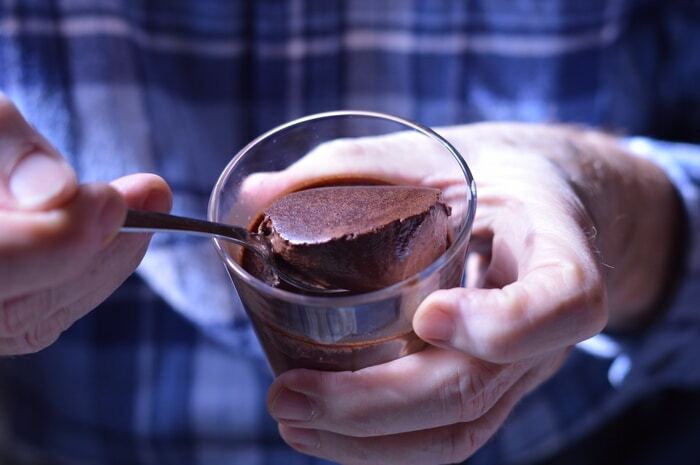 Serve with shavings of dark chocolate over the chocolate panna cotta. 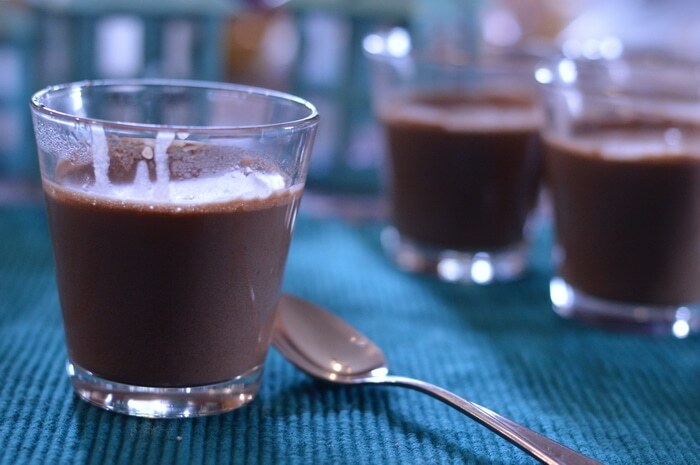 When you are looking for a rich and satisfying chocolate dessert that is paleo friendly, allergy free and delicious enough for company, choose this dark chocolate panna cotta. No one will know it only took you 10 minutes to make it. You can use homemade coconut milk, canned coconut milk, canned coconut cream or any combination that totals 2 cups of liquid. Unlike panna cotta made with milk, this dessert, when made with coconut milk, can safely be frozen without loss of quality. 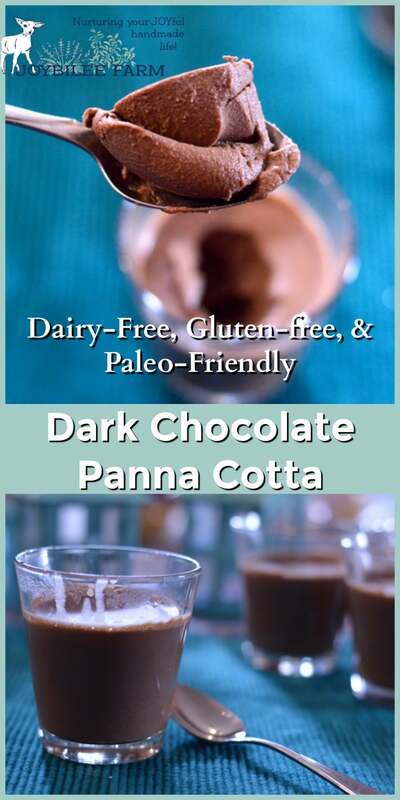 Panna cotta is an easy to make dessert that is paleo friendly, gluten-free, and dairy-free when made with coconut milk. It can be made in just a few minutes and can be made ahead and frozen for special events. Healthier than pudding or easier to make than custard, it satisfies the craving for rich and creamy sweets, while being healthy and rich in antioxidants. I know someone is going to ask if this can be made with milk. Yes, you can make it with milk or half and half or cream. It is traditionally made with milk. And the product I purchased from Costco was a dairy product. But when made with milk the method is different. Dairy milk scorches easily and will separate when boiled due to the presence of milk proteins and lactose, which are absent in coconut milk. 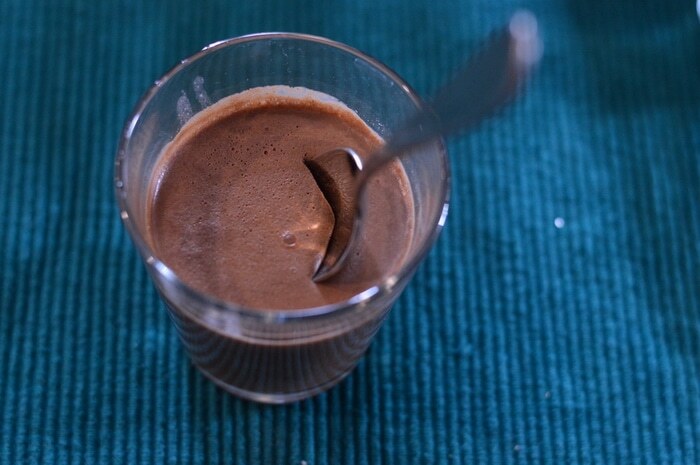 So if you decide to alter this dark chocolate panna cotta recipe by substituting dairy for the coconut milk you’ll need to change the method. I have made something similar to this by accident once, but I only used 3 ingredients. Mush easier and if you heat it up again it turns back into a creamy dairy free hot chocolate (which is how I accidentally came upon my version). It’s simply the coconut cream from the top of a can of coconut milk, sweetener of choice (maple syrup is what I used), and cocoa. heat it on the stove, add cinnamon if you like, and have as hot chocolate or put in the fridge for pana cotta. Panna cotta is solid at room temperature. Too much sugar in maple sugar. 😛 We’re Keto to fight cancer. …..so a. Month later I took out two servings from the freezer….it was a grainy texture throughout now but the taste was the same….would that be the cacao powder or the gelatine? I’m not a “jello” texture fan so was very hesitant but am always on the lookout for a new recipe for my type one granddaughter….low carb desserts.. So I tried this as a devoted dark chocoholic”! I used Lindts 85% dark (no dairy is crucial) and it was still plenty sweet enough. This will work for my granddaughter really well….and it won’t disappear fast ( neither of us care for gelatines) so am very happy to freeze it for her!,!! Thanks Chris as always!! This looks soooooooo yummy! I can’t wait to make it!